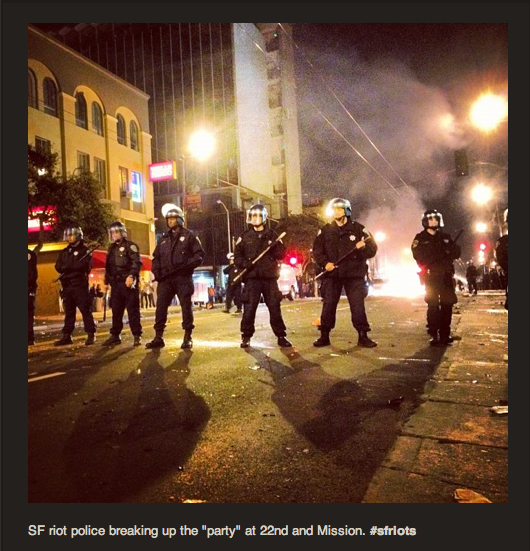 Pando: Could Sandy be Instagram's big citizen journalism moment? Could Sandy be Instagram's big citizen journalism moment? Facebook's $750 million purchase of Instagram was clearly good for its founder. But it's hard to argue that being owned by Facebook hasn't been good for Instagram the company as well. After the announcement of the deal, Instagram went from about 30 million accounts to 100 million. That matters because Instagram isn't one of those mobile apps -- like Foursquare or Shopkick -- that's content to build a lucrative business off of tens of millions of users. Founder Kevin Systrom wants it to be as massive as the largest social networks on the Web. But sheer user growth isn't enough for Systrom. Speaking at PandoMonthly two weeks ago for the first time since the deal was announced, he chafed at the depiction of Instagram as merely a way for rich kids to share opulent purchases like Louis Vitton guns. Instead, Systrom wants Instagram to be the place where people share serious news in image form, the place where people see meaningful glimpses of one another's worlds. "A lot of people think of Instagram as pretty filters and pretty photos," he said. "I think that what we're going to do is allow more exploration and more communication. Instead of just taking a photo and hoping that people will see it, it's about getting it out there in different ways." Hurricane Sandy -- or Frankenstorm Apocalpyse as it's being called on Foursquare -- could be Instagram's big citizen journalism moment. The time when the seemingly frivolous app could get some Arab Spring-style gravitas. Just like the last three Presidential elections have been transformed by a new social media service -- YouTube, Facebook and now Twitter -- natural disasters and tragedies are emerging as a way for social media services to gain respect and legitimacy as world-changing agents as well. In theory, Instagram has Twitter's immediacy, and a broader reach, since it pushes notices out via Twitter, Facebook, Instgram's own network, and email. Clearly images are the best way to tell a story like this, and Instagram's whole raison d'être is to make people better photographers. Add to that the storm's target on urban, hipster, we're-not-scared New Yorkers, and the time seems as good as any for the revolution to be Instagrammed. But clever as they are, sites like Instacane may be a footnote on social media's coverage of the story. Is Instagram immediate enough to be the dominant place where the story unfolds through images, or is it more of the glossy magazine to Twitter's broadcast? While a neighbor's house is, say, blowing away, is there something unseemly about pausing to flip through filters? And in the heat of a real-time breaking story, do you need the extra step of posting on Instagram? Why not just post a picture directly to Twitter? It will come down to how accustomed Instagram's users are to taking out their phones and grabbing that app first when they have the instinct to capture something. It's not clear that Instagram has taken that away from Twitter. With a simple line of text and a hashtag, they were immediately picked up by neighborhood blogs and have been picked up by news sites this morning. 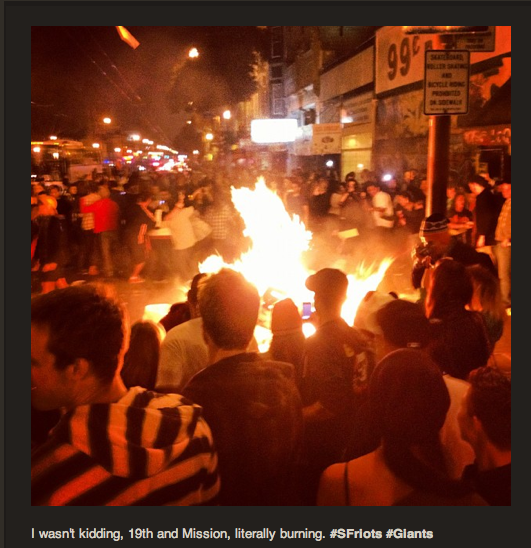 But the fact that my husband's two photos were so widely used indicates that Instagramming the riots wasn't exactly widespread in San Francisco. We also saw this with the Empire State Building shooting, where several major news outlets commented on this photo asking to permission to use it. But so far, these have been one-off occurrences, centering around a single image, not a mass event told through hundreds of images. And there's no reason that image couldn't have been snapped via another service and shared another way. For Instragram to live up to Systrom's lofty goals, it needs to enable some communal story telling that wouldn't exist another way. That's what Facebook and Twitter did with global revolutions. I'm not sure Instagram is there yet. For example, more than five times the number of people Retweeted my husband's riots photos as favorited them on Instagram. That's likely where they were picked up by news outlets. If Instagram has its moment this week, it won't happen without a big assist from Twitter. People may capture news on a new app, but Twitter is still the way people consume it, whether in picture or text, filtered or unfiltered.